as networking. Nothing has ever come close to the success we have had with this company. We have always loved the service that we offer to individuals and businesses. And the best part, the winner is always the person with our legal and identity theft membership. We were very fortunate to be one of the founding associates in Canada and the first Canadian Regional Vice Presidents with the company. We earned more than $100,000.00 our first six months and a few years later we were the 109th family to join the Millionaire Club. For more than 18 years we have shared the Stoneciphers’ dream and now continue on with all the new great leaders of our company. We are also so proud of our Team, especially the Executive Directors and our fantastic upline support team – the Melia Family. 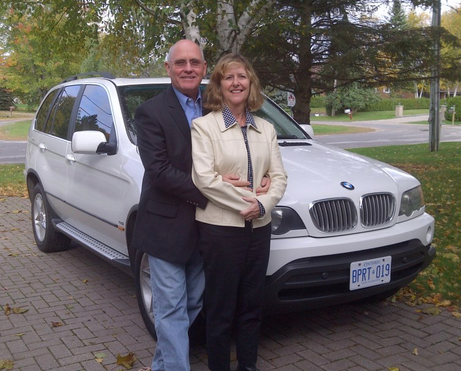 Performance Club has enabled us to travel to many beautiful places with our LegalShield friends and we drive a BMW ! We are very proud of our adult kids and their partners. They are all involved with us in LegalShield at some level and have been a huge support for us. We love the time we are able to spend with them and with our grandkids. We love living on beautiful Lake Couchiching just north of Toronto. We are able to work from home and enjoy the lake but when winter hits we are so fortunate to be able to get in our RV and drive south for warmer weather! We visit friends and family as well as team members on our trip down to Florida. Our dream now is to continue to help others achieve what we have accomplished and much more. We want to thank our TEAM, and all the home office staff at LegalShield we are so proud of you. Our goal this year is to help 3 team members on 3 legs earn Executive Director and solid Platinum thus earning the $200,000 ring!